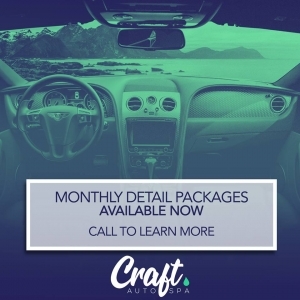 The Craft Auto Spa Team Provides The Entire Tampa Bay Area with Luxury Mobile Spa Services. We do this by offering a single detailing package to ensure every customer and every car is detailed equally. We offer our services in your driveway or your office, after you schedule an appointment we’ll confirm the location. What Spa Packages are Offered? Pending your vehicle size, you pay a flat cost for a full interior and exterior detailing. We treat every car and every customer the same. Do I have To Join Your Monthly Spa Club? No…Whether you are a one time customer or Monthly VIP member you get the same signature handcrafted shine. Do You Offer Paint Correction or Protection Services? Yes, Craft Auto Spa still offers mobile ceramic coating and paint correction services. You can learn more here. Book Online Join Our Monthly Wash Club! Sign Up For Craft Auto Spa’s Newsletter! Sign Up Today & Save $25 Off Your First Booking!